THE HAFNER GYROPLANE has a device enabling the pilot to adjust the incidence of the rotor blades. This device and a practical rudder enable the pilot to twist and turn with great ease and swiftness. Further, a lift-control lever is used which gives the pilot some control during the vertical ascent, and he is thus able to “feel” his way into the air. MOVING wing flight differs from fixed wing flight in that the lifting surfaces move with relation to the body or fuselage of the machine. Helicopters, ornithopters and gyroplanes are all moving wing flying machines, whereas conventional landplanes and seaplanes are fixed wing flying machines. Man’s earliest conception of a heavier than air aircraft was probably a moving wing machine, one resembling a bird, with wings which could be flapped. We have in the drawings of Leonardo da Vinci and of other prophets and pioneers plenty of evidence that inventors turned early towards the moving wing machine, towards something resembling the helicopter. They may have been influenced by the toy helicopters which the Chinese are supposed to have had for thousands of years. These toys consist of screws which are forced up a threaded stick and so are given a high speed of rotation at the moment they leave the stick. They then screw themselves up into the air. Early concentration upon moving wing flight, however, did not prevent the believers in fixed wing flight from gaining a lead, and the birth of practical aviation was the outcome of the success of the fixed wing type of machine. When once the fixed wing machine had been invented it made rapid progress, but this progress did not at first stultify invention. Until the war of 1914-18 no one would have dared to say that the fixed wing type of aircraft was destined to be the only type. On the contrary, the helicopter was still attracting attention. During the war, however, there was no time to develop unusual types of machines, and people were content to develop as quickly as possible the types already in existence. Thus the fixed wing machine made progress and the moving wing machine was almost forgotten. After the war attention again turned spasmodically to the moving wing machine and many people believed in the moving wing conception of flight, even when the fixed wing machine was showing a high degree of effectiveness. A fundamental fault of the fixed wing type of flying machine, and a fault from which it must always suffer to some extent, no matter how it is developed and modified, is that it cannot hover, nor can it land and take off in still air without a run. Accidents used to happen mainly because pilots were seeking to fly too slowly in fixed wing machines. They then stalled and the machine fell to the ground. Designers were confronted at frequent intervals with a demand that the risks attending the stall, or the attempt to fly slowly, should be removed. With the fixed wing machine, however, it was fundamentally impossible for them to overcome that fault. They might reduce its seriousness, but they could not hope to eliminate it. So attention turned to the moving wing machine. The British Air Ministry offered substantial prizes in 1924 for moving wing machines; but there were no entrants for the competition. 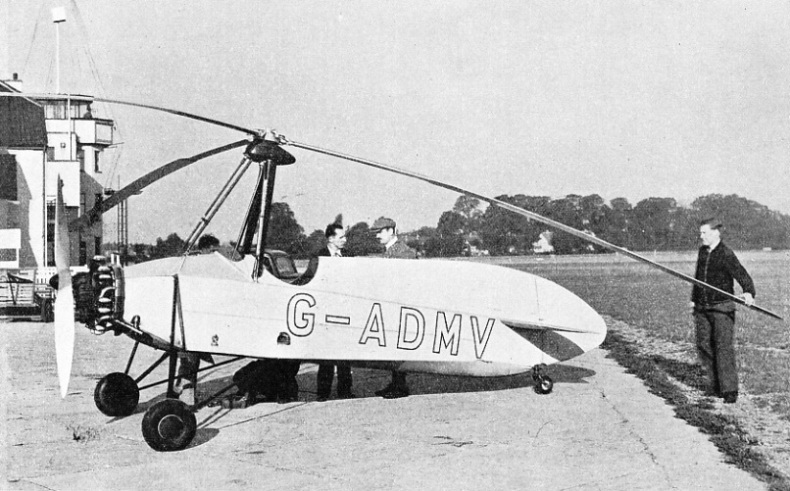 The Air Ministry also sponsored the building of a helicopter at Farnborough (Hampshire), and a certain amount of progress was made, but the machine never reached the stage of making independent free nights. Meanwhile, from January 1923, messages had been coming through of some work done on the moving wing type of machine in Spain by an inventor named Senor Don Juan de la Cierva. At first these messages were regarded with scepticism in Great Britain. There had been so many abortive attempts to produce such machines abroad that the idea had arisen that they were impossible. 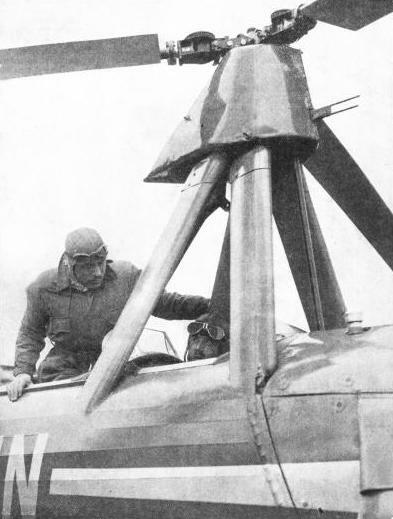 But Mr. H. E. Wimperis, who was at the time Director of Research at the Air Ministry, believed that there might be something in Cierva’s machine, for which he registered the name “Autogiro”. Mr. Wimperis invited him to bring it over to England and to demonstrate it at Farnborough. Senor de la Cierva accepted the invitation and came over to England with his machine, an “Autogiro” aircraft built on an Avro fuselage. 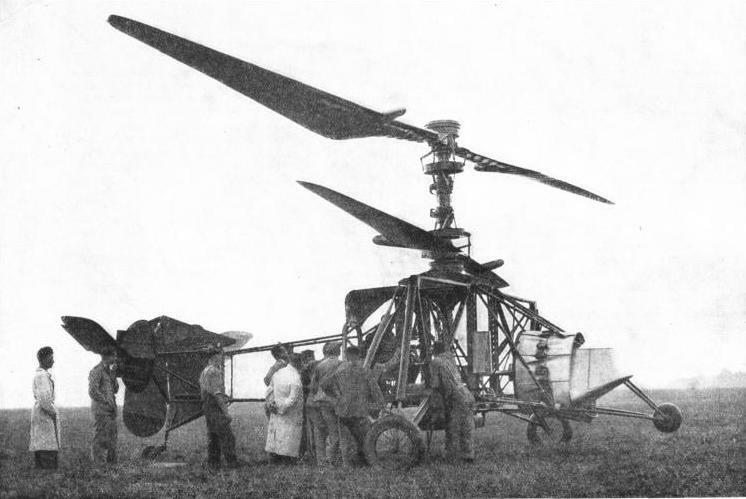 Until then the machine had been freely described as a helicopter; but the “Autogiro” aircraft differs from the helicopter in one essential: the lifting rotor is not power-driven when the machine is in flight. In an “Autogiro” aircraft the rotor is caused to rotate, by the movement of the machine through the air, movement which is caused by an engine and airscrew in exactly the same way as in an ordinary aeroplane. The movement provides the air stream which turns the rotor and the rotor in turning provides the necessary lift. There is, in addition, in this type of aircraft, another important feature, introduced for the first time in “Autogiro” aircraft. It is the articulation of the rotor blades. Each blade of the rotor - and Senor de la Cierva tried two, three and four blades - is articulated at the root, and is free to flap up and down. When the machine is in flight the rotor blades do flap up and down, and they also turn. This flapping motion has the vitally important effect of providing the machine with automatic stability. When the blade is coming forward, and is therefore given a higher relative speed through the air than when it is receding, the blade rises; when it is receding, it falls. This flapping correctly balances out the lift so that the machine is automatically stable when it is in flight. Senor de la Cierva explained these two features of his machine shortly after his arrival in England. He also went into the theory of the machine, and showed that it could not stall like a fixed wing aeroplane, and that it would be able to descend almost vertically and to land almost without a run. He expressed the view that it would not oust the fixed wing aeroplane for long-distance work, but that it would come into extensive use for short journeys and for private flying. INVENTOR OF THE “AUTOGIRO” AIRCRAFT, Senor Don Juan de la Cierva. He invented this type of rotating wing aircraft to overcome the danger in stalling a fixed wing aeroplane. It was a sad loss to aviation when he was killed in a fixed wing air liner crash at Croydon on December 9, 1936. He was modest in his claims and practical in his ideas. Until the time of his death, which by tragic irony occurred in 1936 at Croydon in an accident to a fixed wing machine, Senor de la Cierva gave frequent and incontrovertible proof of his genius. His moving wing machine developed swiftly. But he was always full of ideas to make it still more efficient. He was playing a lone hand against the aircraft manufacturers of the entire world, but he succeeded in claiming more and more serious attention for his machine, and in performing the feat of bringing moving wing flight to the stage of practical utility. It was the first time in history that it had readied that stage. An “Autogiro” aircraft consists of an ordinary aeroplane type of fuselage with a fixed tail plane and a fixed fin. There is neither a movable elevator nor a movable rudder, for all control is done directly by tilting the axis of the rotor. The engine is mounted in the ordinary way in the nose of the fuselage, and it drives an ordinary airscrew. The undercarriage is of conventional type, but the shock-absorber legs generally have a longer travel than is normal. The rotor is mounted on a shaft extending upwards from the fore part of the machine, and the blades are articulated. For starting purposes, the engine is clutched in to the rotor shaft while the machine is on the ground with the wheel brakes on. The engine throttle is opened and the rotor is gradually speeded up until there is obtained a rate of revolution closely approaching that required for flight. This rate is about 180 revolutions a minute. The wheel brakes are then released, the clutch joining engine and rotor is disengaged, and the machine runs a few yards and then lifts. When it is coming down, an almost vertical descent can be made. Later developments of the machine enable a vertical jump to be made at the moment of take-off. This method of take-off was one of Senor de la Cierva’s last inventions before he was killed. He read a paper on the subject before the Royal Aeronautical Society in March 1935. The process is partly automatic. An extra articulation is introduced in the rotor blades. When the engine is driving the rotor, the blades remain at an angle of no-lift; but directly the engine is declutched the inertia of the blades causes them to move about the articulation and to adopt an angle of lift. The machine makes a sudden jump which can be twenty or thirty feet high. At the end of the jump the machine is in a nose-down position, so that it is ready to take up forward flight. The jump take-off allows the machine to clear obstacles and to get into the air without any forward run, but the vertical ascent cannot be continued indefinitely. Forward motion must be substituted at the top of the jump for vertical motion, and the height of the jump is strictly limited. In short, the “Autogiro” aircraft, like the fixed wing type of aeroplane, depends for its lift upon forward motion through the air, although that motion need not be nearly so rapid as that of a conventional aeroplane. Even when it is making a vertical descent, there is a relative air-stream flowing past the rotor blades. Comparatively recently the Hafner gyroplane has been introduced and has performed well at various air displays and meetings. It bears a certain resemblance to the “Autogiro” aircraft, but it has a number of special features. The main feature is the device for allowing the pilot to adjust the incidence of the rotor blades. 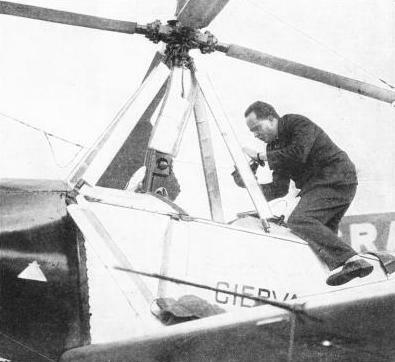 Control of the Hafner gyroplane is secured, not by tilting the axis of the rotor, as in the “Autogiro” aircraft, but by altering the incidence of the blades. In this way the machine can be made to alter its attitude in the air, to turn and to manoeuvre. It has a practicable rudder which the pilot uses to aid him in manoeuvring, and with this and the variable incidence he is able to twist and turn with great ease and swiftness. Another important feature of the Hafner gyroplane is that, for the vertical take-off, a lift-control lever is used which gives the, pilot a measure of control during the vertical ascent. In the words of the inventor, the pilot can “feel” the machine into the air. ROTORS TURNING IN OPPOSITE DIRECTIONS are a feature of the Breguet-Dorand helicopter. The opposite rotation cancels out the torque reactions and assists the stability of the aircraft, which has no ordinary airscrew and is tilted to obtain forward flight The two rotors are mounted concentrically. It is also stated that the method of attaching the rotor blades of the Hafner gyroplane to the hub, by means of tie rods, has special advantages which enable a marked reduction in weight to be achieved. Thus the weight-lifting capacity of the machine is good for a moving wing type. Moreover, it is claimed that the speed capabilities for the power used are also exceptionally good. Senor de la Cierva announced his belief that moving wing flight would be better suited to high speeds than fixed wing flight, and about 1925 he had roughly planned an “Autogiro” aircraft with a theoretical top speed of some 300 miles an hour and a landing speed of only 60 miles an hour. Helicopters have hitherto not been so successful as other types of moving wing aircraft; but a certain amount of progress has been made with them. The Brennan was flown in the balloon shed at Farnborough. Meanwhile, in France, a great deal of work on helicopters has been in progress and it has led to a number of successful flights. The names of Oemichen, Heinrich Focke, Berliner, Breguet, Florinne, D’Ascanio, and Asboth have been prominent in this work. Most true helicopters, in which the lifting rotor or rotors are power-driven, now use some kind of articulated blade to obtain stability. The two-way rotor has been extensively tried and has given good results in the Breguet-Dorand. In this machine two lifting airscrews are mounted concentrically and they rotate in opposite directions. The Breguet-Dorand has no ordinary airscrew. The whole machine is tilted to obtain forward flight. The opposite rotation of the rotors cancels out the torque reaction and aids in giving stability. Opposite rotation was used in the Italian record-breaking seaplane in 1934, when Agello attained 441 miles an hour; but in that instance the airscrews were the ordinary ones. The principle is exactly the same when opposite rotation is used for lifting purposes. ROTOR MOUNTING on a Cierva “Autogiro” machine. All control in this type of aircraft is effected directly by tilting the axis of the rotor, which is operated by a control coming downwards from the rotor mounting. The shaft through which the engine turns the rotor when the machine is on the ground can be seen rising to the front of the rotor mounting. The Florinne helicopter, which was made in Brussels, also uses twin rotors turning in opposite directions; but the rotors are mounted at opposite ends of the framework which constitutes the fuselage. This machine uses four “feet” instead of wheels for the undercarriage. The Italian D’Ascanio helicopter uses oppositely rotating rotors on the same vertical axis. It weighs 1,764 lb, has a 95 horse-power Fiat engine and has made fairly lengthy hovering flights. One of the most successful helicopters is the Focke. Flown by Herr Rohls, it is said to have climbed to about 7,500 feet, to have remained in the air for 1 hour 20 minutes 49 seconds, to have attained a speed of about 76 miles an hour for 12½ miles, and to have flown in a straight line for 10 miles. The exact figures have been submitted to the Federation Aeronautique Internationale for confirmation as international helicopter records. Moving wing flight is not, theoretically, confined to machines having rotors with their axes vertical or nearly vertical. A patent was taken out some time ago by the Rohrbach Company for a “paddle wheel” aircraft or “Cycloplane”, in which were rotors turning on horizontal axes. Calculations suggested that the machine should be able to fly, but no full-scale work was done. Possibly the aircraft with fully slotted and flapped wings should also be included among moving wing types. This type was exemplified in the Handley Page “Gugnunc”, which was specially built for the Guggenheim safe aircraft competition in America. This machine appeared to be a normal small biplane, but the wings incorporated wing slots running along the entire leading edge and there were also slotted flaps running along the entire trailing edge. The front slots were divided up into a main lift slot, taking most of the span, and two control slots at the wing tips. The lift slot was connected with the flap at the trailing edges of the wings. When the front slot opened the flap came down and the machine was furnished with additional lift automatically and without any action on the part of the pilot. This machine was capable of flying very slowly and of landing in a short space. It could also take off at slow speed at a steep angle. It was shown several times at the Royal Air Force Display at Hendon, where it flew at the same time as the “Autogiro” aircraft and the “Pterodactyl”, or tailless aeroplane. The “Pterodactyl” is intended also to provide a solution of the problems of slow flying and of stability at and beyond the stall, but it is not a moving wing type. Another type of moving wing machine was the Gerin “Varivol”, which was tested in the big French wind tunnel at Chalais-Meudon and which was flown. On a later test flight it crashed and the pilot was killed. In this machine the wings were of variable area and could be “unfurled” to give greater area or closed up to give greater speed. The theoretical results were promising. Mention must be made also of the Kay gyroplane, which resembles the “Autogiro” aircraft, but has variable incidence blades, and of the American Herrick “Vertaplane”, which has a pair of ordinary wings of small size and above them a two-bladed rotor. This machine has an ordinary airscrew and fuselage. It is impossible to predict with any confidence the future of moving wing flight. It seems to have a fundamental advantage in that it uses a principle similar to that of the wheel: “the principle of angular displacement of a unit relative to another, infinitely and continuously”, as Mr. Hafner has put it. There are many other ways of transporting people and goods over the ground than by using the principle of rotation in the wheel; but the wheel has proved far the most popular and the most successful. In the air the moving wing has shown as yet no comparable marked advantage over the fixed wing. Theoretically it would seem that, for short-distance flying, the moving wing may yet make its way and may become more popular than the fixed wing. That is the interpretation which some people place upon the almost continuous demand that is heard for machines which can land in a short space and take off in a short space, and which can fly slowly in conditions of poor visibility. Private flying has made slow progress mainly because in poor visibility the problem of making a take-off or a landing is fraught with risk. The reason is that the fixed wing machine, fundamentally, owes its lift to its forward speed. No kind of modification of the wings will enable this difficulty to be overcome. Thus, it seems that the moving wing machine should be able to find adequate scope. It may be expected, therefore, that the energetic experimental work will bear fruit in a practical aircraft for general use. It would be hazardous to try to build up in any detail a picture of the machine that might prove successful; but it seems that the powers of vertical take-off and vertical landing, furnished only by rotating wing devices, would be essential to its success. Thus those who like to try to peer into aviation’s future would do well to watch the moving wing type. Wheels - not the internal combustion engine - are in reality the foundation stone of the motor vehicle. Rotors, not wings, may well prove to be the foundation stone of the private flying machine. Wings are used by birds, it is admitted, but only moving wings. The fixed wing is not found in Nature. It may be that a lesson remains to be learnt from that fact. 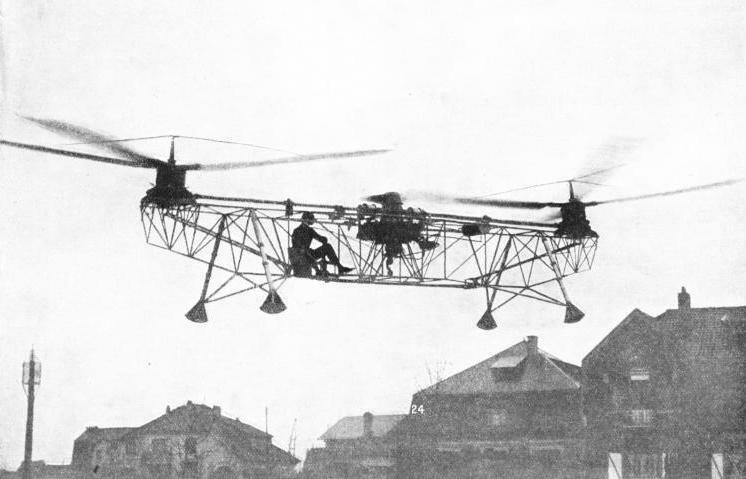 THE FLORINNE HELICOPTER was built in Brussels and has “two” rotors which turn in opposite directions, one rotor being mounted at either end of the framework. The undercarriage has four “feet” instead of wheels to carry the aircraft when it is resting on the ground. You can read more on “How An Aeroplane Flies”, “Unorthodox Aircraft” and “Wing Loading Problems” on this website.